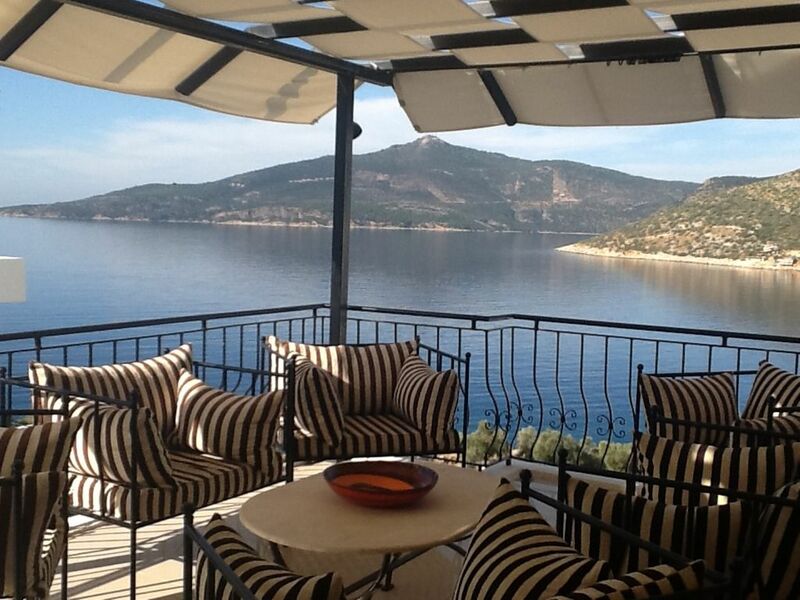 Villa Serendipity is a three bedroomed villa in the prestigious area of Komerluck Kalkan. The villa is situated 50 metres from the sea and within easy reach of all amenities in the town. The setting is peaceful with lovely views of the sea and surrounding villas. Enjoy watching the boats go out on their daily trips whilst relaxing on the terrace. Watch the sunset We are a 50 mtr walk over to the Palm beach restaurant and beach club where you can sunbathe, have breakfast, lunch or just a drink before getting the water taxi into town. We first came to Kalkan on holiday about 14 years ago with a company called Tapestry and stayed in the Ada apartments which were owned and built by Tekin and Halit Ada. We fell in love with Kalkan and it's people and had the most wonderful holiday.We felt we did not want a holiday anywhere else so continued to holiday there every year. As most people do, we dreamt that one day we would have our own holiday home in Kalkan and a few years later that dream became a reality. We bought a plot of land and our villa was built. We have had some lovely holidays in Kalkan and over the years have seen the area develop but the people remain the same, lovely warm hearted and friendly. I can't ever see us changing and going somewhere else as this has become our second home. We have lovely views in a peaceful and beautiful location.Sitting having breakfast watching the boats go out on there day trips each day is a wonderful sight, as is watching the sunset each evening. We feel very lucky and blessed to have a home in such a tranquil setting. Downstairs ground floor shower, WC and wash basin 1st Floor Bathroom, walk in double shower, WC and handbasin 2nd floor Bathroom! Walk in double shower WC and wash basin All bathrooms have mirrors with lights above and shaving sockets. Stayed here in September 2018 and this is one of the better villas we have stayed in. Villa itself is in a great location, above palm beach club and although on a (very) steep hill.....taxi’are cheap and plentiful should it seem too much . It is however only a 15 minute pleasant walk into town. (A short,sharp steep section, then flat!) The villa is very spacious and has everything you could possibly need with loads of different terraces to relax and find shade (or your own space) should you need it. We never tired of after- sun vino’s watching spectacular sunsets ! Beds were comfy and showers were good. Everywhere was spotless. The owner communicated frequently and answered all ours questions and the maintenance team appeared very quickly when the hot water tank sprung a gushing leak! Air conditioning was lacking in the living room, but that didn’t really affect us. We would love to return one day. Thank you. Many thanks for a lovely review. We are glad you enjoyed your stay. We have taken on board your comments regarding air conditioning in the lounge and this has been addressed for the coming season. We aim to please all our guests during there stay and appreciate all comments made. We hope to see you again in the future. We stayed at villa serendipity last year and couldn't wait to go back again this year. The villa is beautiful with lovely furnishings and everything you could want to make for a comfortable holiday. Carole and Paul are always very helpful and the welcome pack is a really lovely gesture. We will certainly be returning to this wonderful place. Thank you for your lovely comments, we try hard to make sure that the villa is as comfortable as possible to ensure you have a wonderful stay. We hope to see you again soon. It's hard to put into words how beautiful this villa is. The quality of the furnishings is second to none and far superior to most holiday villas. Carol and Paul have thought of everything. We had the most relaxing week, staying at the pool most of the time as it was so hot. It was lovely having our morning cup of tea on one terrace and then our breakfast outside at the beautiful table near the pool. The most difficult decision we had to take each evening was which restaurant to choose from the vast array in the town. You need your flat shoes for walking in! We can't recommend it highly enough and will definitely be back. Thank you, Carol and Paul for all the extra little touches. If you want a 3 bedroom villa in Kalkan then look no further. The service and information provided prior to departure was perfect. We spent two weeks at Villa Serendipity and it was bliss. 15 minute walk into Kalkan. Choice of either the road above Kalkan or coastal path. Both are quite steep and flat shoes are a must. Which ever route you choose take your camera. The villa has been so well thought out by Carole and Paul. It really is like being at home but in a stunning sunny setting. Photos of the villa do not do it justice. The staff that work for Carole and Paul were great. Text Bayram for any issues and they are sorted straight away. The mid holiday clean was great. Did transfers and car hire through a Brave Tours who provided an exceptional service. Hope to be able to return as Kalkan is such a special place and I now know the perfect place to stay. This villa is fantastic and lots of details have been thought of; shady areas, comfortable chairs, mosquito nets, Wi-Fi, stereo, water coolers and much more. The views of the bay are truly spectacular and the days drift easily by as you watch from the pool or the roof terrace as the jet ski`s and day trip boats set off and return. We had a lovely family holiday and do not hesitate to recommend the villa. Have stayed at different villas in Kalkan for the last seven years and villa serendipity has been the best to suit my family needs by far. In total 5 adults. Upon our arrival ( midnight ) it was so nice to see a welcome pack which meant we were able to make ourselves a drink before going to bed. Plus an added bonus was that the villa has two large 9ltr water machines which made life very easy. Once they ran out I made a quick call using the villas mobile phone to Bayram ( who takes care of the villa ) and he arranges for more to be delivered. Another big bonus is that there are so many lovely seating areas both inside and out to choose from when looking to be on your own for a quiet read or snooze. Truly felt like I was at home what with the well equipped kitchen, entertainment in the form of DVDs, Games, and a good selection of CDs to play. Each evening we went up onto the roof terrace for drinks to enjoy the beautiful view and sunset before going out. Again plenty of seating, Plus a complete area that was fitted out with a sink, fridge,kettle, CD player, and water tank, and all else needed to make life easy. Finally I must add that our mid stay bed linen change & clean was excellent. Very nice couple who did a thorough job. Looking forward to my next stay, hope I can get booked in. Thank you Carole & Paul, you've put a lot of thought into making sure your guests are as happy and comfortable as is possible. The villa is a ten minute stroll into Kalkan centre, or 5 minutes by taxi/car. We are 100mtrs from Palm beach restaurant and beach club, you can also use the water taxi into town if you stop off there for lunch or drinks first. Kalkan has a lovely beach which is pebble and shingle, there are restaurants and cafe bars alongside the beach and around the harbour.There is also a beach at Patara which is about 15 mins by car/dolmus Patara also has the ancient ruins and amphitheatre. The main airport is Dalaman and the transfer is approx 1 1/2 hours or two hours if you want a comfort stop. Private transfers can be organised should you require. Car hire is also available from the airport. There are many historical sites to visit and there are tours which can be booked in the town. Places of interest are Kekova the sunken city. Catch a boat and visit the greek island of Mace with its beautiful churches and harbour restaurants. Drive to Kas along the coast road with its stunning views, lunch at the marina or visit the many restaurants and shops. Visit the ghost village of Kayakoy, or a day at Saklikent Gorge or Xanthos all great days out.